Worcestershire Sauce is an Indian recipe brought to the UK after Lord Marcus Sandy's tour of duty as the Governor of Bengal. Lord Marcus Sandy commissioned chemists John Lea and William Perrins to recreate this sauce from his recipe. The initial sauce tasted so horrible that it was abandoned in the chemists' cellar. It wasn't until several months later that they discovered the mixture had matured beautifully in the oak barrels, and in 1838 the famous sauce was launched. Worcestershire sauce is a great addition to any savoury recipe, such as casseroles, soups, grilled meat or cheese dishes. dark liquid sauce that can be mistaken as soy sauce. Choosing: Before buying, make sure you check the expiration date of the sauce. Do not buy sauce with broken seal. Buying: You can buy this sauce at the local and supermarkets. Procuring: The sauce is made through fermentation of mixed ingredients. The ingredients of a traditional bottle of Worcestershire sauce are malt vinegar, spirit vinegar, molasses, sugar, salt, anchovies, tamarind extract, onions, spice, garlic, cloves, soy sauce, lemons, pickles and peppers. Japanese worcestershire sauce is made from purees of fruits and vegetables like apples and tomatoes, mixed with sugar, salt, spices, starch and caramel. Used mostly to flavour grilled or barbecued meats. It can be used as a condiment or steak sauce and also an addition to chili con carne. It is also used in cocktails such as Bloody Mary or Caesar, and other drinks. Worcestershire sauce is also a common ingredient of Caesar Salad. Cleaning: Worcestershire sauce that can be purchased in stores are ready to consume. Be reminded that the storage time shown is for best quality only — after that, the Worcestershire sauce's texture, color or flavor may change, but in most cases, it will still be safe to consume if it has been kept continuously refrigerated. It is important that you refrigerate it after opening to help preserve flavor and extend shelf life. In the event it develops an off odor, flavor or appearance, it should be discarded immediately for quality purposes; if mold appears, discard the entire product. Worcestershire sauce plays a part in the cuisine of Asian regions following exposure to Western cuisine. In Cantonese cuisine, Worcestershire sauce was introduced in the 19th century via Hong Kong and is today used in dim sum items such as steamed beef meatballs and spring rolls. The Cantonese name for this sauce is "gip-jap" (Chinese: 喼汁; pinyin: jiézhī; Cantonese Yale: gip jāp). It is also used in a variety of Hong Kong-style Chinese and "Western" dishes. In Shanghainese cuisine, the use of Worcestershire sauce spread from European-style restaurants in the 19th and 20th century to its use as an ingredient in ubiquitous, Eastern European-inspired dishes such as Shanghai-style borscht, and as a dipping sauce in Western fusion foods such as Shanghai-style breaded pork cutlets. It is used for Chinese foods such as the shengjian mantou, which are small, pan-fried pork buns. In Shanghai, Worcestershire sauce is called "la jiangyou" (Chinese: 辣酱油; pinyin: làjiàngyóu; literally "spicy soy sauce"). After imported Worcestershire sauce became scarce in Shanghai after 1949, a variety of local brands appeared. These are now in turn exported around the world for use in Shanghai-style dishes. Lea & Perrins has in recent years established a plant in Guangdong, China, thus increasing availability of the original variety in China. However, it does not have a dominant market share compared to the native-grown varieties. 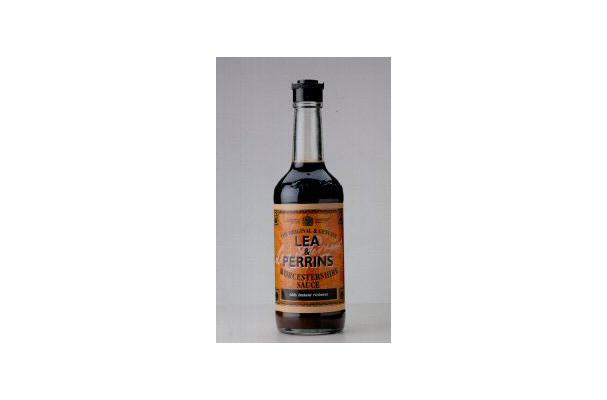 In Thailand, the Lea & Perrins Original Worcestershire sauce on sale is, according to its label, imported from England. History: A fermented fish sauce called garum was a staple of Greco-Roman cuisine and of the Mediterranean economy of the Roman Empire. Pork meat sauce and vinegar, and the use of some similar fermented anchovy sauces in Europe, can be traced back to the 17th century. The Worcestershire variety became popular in the 1840s and is a legacy of the British rule of the Indian sub-continent. Theories vary concerning its discovery or invention.